A delicious warming drink made using chocolate and milk, simples. First warm your milk taking care not to burn it, stiring helps this process, then add chocolate, starting with about three heaped desert spoonfulls per mug of milk, if you add more then that is fine, if you add less then that is not fine and the "Sweetie Police" may get you. 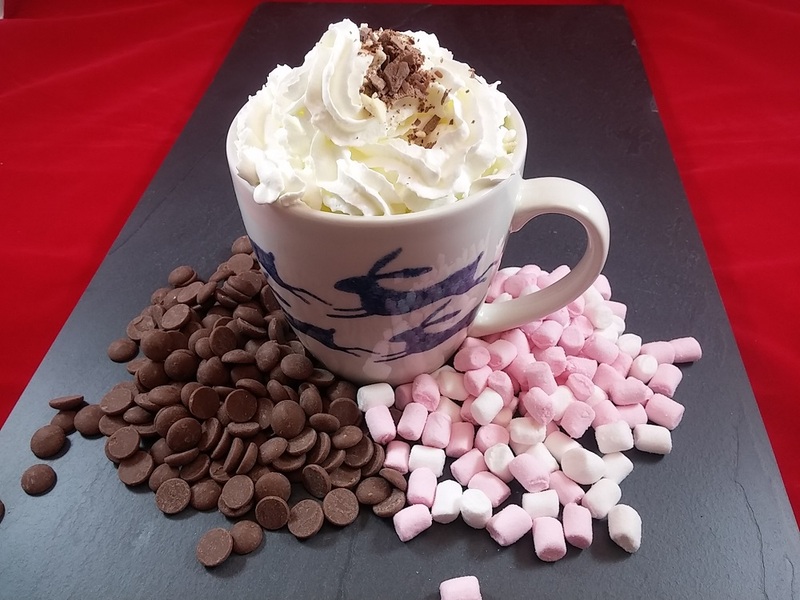 The secret behind any hot chocolate drink is in the mixing, you need to mix/stir very well or even BLEND to make all the chocolate disappear into the milk and then you have a truly lovely drink, add marshmallows or cream if you like and sprinkle more grated chocolate on top if you wish. Chop the chocolate and tip into a large bowl, milk white or dark. Put the cream and butter into a saucepan and heat gently until the butter melts and the cream reaches simmering point. Remove from heat, then pour over the chocolate. Stir the chocolate and cream together until you have a smooth mixture. Add any flavourings to the truffle mix at this stage (divide the mixture between bowls and mix in liqueurs or other flavourings, a tsp at a time, to taste. Try bourbon, Grand Marnier, coconut rum or the zest and juice of an orange), or leave plain. Cool and chill for at least 4 hrs. To shape the truffles, dip a melon baller or teaspoon in hot water and scoop up balls of the mixture, then drop the truffles onto greaseproof paper. Or lightly coat your hands in flavourless oil (such as sunflower) and roll the truffles between your palms. Coat your truffles immediately after shaping. Tip toppings into a bowl and gently roll the truffles until evenly coated, then chill on greaseproof paper. Try: crushed, shelled pistachio nuts; lightly toasted desiccated coconut; popping candy; or roll a truffle flavoured with orange zest and juice in cocoa powder. To coat in chocolate, line a baking tray with greaseproof paper. Melt 100g milk, dark or white chocolate for 10 truffles. Allow chocolate to cool slightly. With a fork, pick up one truffle at a time and hold over the bowl of melted chocolate. Spoon the chocolate over the truffle until well-coated. Place on the baking tray, then chill. Later we will get into tempering your own chocolate for that professional taste and "snap". Why is a "truffle" called a truffle. Well its because they look similar to the real thing, and should be a little rough and ready in appearance but are a fraction of the cost of the fungi version and we think a lot more tasty. The main ingredient is called "Ganache " and this is the chocolate and butter-cream combination. Sounds a bit healthy to us but totally delicious and a fab way of getting your chocolate fix.Made this recipe recently and was truly fab, we ate the lot, quite quickly. Preheat the oven to 180°C, fan oven 160°C, Gas Mark 4. Grease and line a rectangular baking tin measuring approximately 25 x 20cms. Melt the chocolate and butter together in a large heatproof bowl positioned over a saucepan of gently simmering water, ensuring the bottom of the bowl doesn’t touch the water. Meanwhile, mash the avocado to a smooth puree using a fork. Whisk the eggs and sugar together for 2-3 minutes until light and airy, then add the avocado puree and whisk again until smooth. Add the flour and salt to the melted chocolate mixture, stirring gently until combined. Pour the mixture into the prepared tin and bake for 25 minutes in the centre of the oven. Cool, then cut into 12 pieces. Tips Freeze the brownies for up to 3 months in a rigid container or freezer bag. Preheat oven to 400 degrees F (200 degrees C). Place a baking rack on top of a large baking sheet. Thread each slice of bacon ( about 12 ) onto skewers; place skewered bacon on the baking rack. Bake bacon in the preheated oven until crisp; 20 to 25 minutes. Remove from oven and cool completely. Combine 1 cup of dark chocolate chips and a desert spoon of butter in a microwave-safe bowl. Heat in the microwave in 30 second intervals until chocolate is melted and smooth, stirring after each interval. Coat each side of the skewered bacon with the chocolate mixture using a pastry brush. Place coated bacon on a sheet of waxed paper. Refrigerate until firm, at least 30 minutes. Store in the fridge until ready to serve. Eat, then please let us know how you liked them.............. or not?